This film really is epic, we all knew it was going to be just that. Everything from the first two films had built up to all of the conclusions in this film. We get to find out the fate of all of our favorite characters, will Frodo make it to Mordor and will he manage to destroy the one ring and end Sauron’s hope of evil prevailing in Middle Earth? Aragorn must step up and become who he was born to be, the King of Gondor. He must reclaim the throne and unite the men of Middle Earth once and for all. He has some just brilliant moments and who doesn’t have a tear in their eye when he says “For Frodo” what an incredible moment in an incredible Oscar-winning film. He kept to his oath made in Fellowship of the Ring and was not going to fail at all. He is probably the character who grows the most over the course of the films and we see that so much in this one. The inseparable Merry and Pippin are split up, which involves some rather emotional moments. Will they ever see each other again as they are both dragged into the battle and want to fight for themselves and to save their friends. I guess Hobbits really do keep surprising you, so brave and noble they become. Eowyn probably provides me with one of my favorite moments due to her line “I am no man” – honestly this is just inspiring stuff. A woman who would not just sit around and wait for the men to do battle, she wanted to be involved, to help and more importantly to fight for her own survival. Something I found just brilliant from the start. Her unrequited love for Aragon is quite sad to watch though, as you cannot help but feel sorry for her. I mean who hasn’t fallen for the wrong man before? Who does not feel the same way back? Probably a lot of us have done just that. Frodo and Sam keep hitting more twists and turns in the quest to destroy the ring, it was never going to be easy or simple especially with Gollum around. But in the end their true friendship gets them through it even if they fall out in the process. But that’s what true friends do isn’t it? Not forgetting the moment when Sam says “I can’t carry it, but I can carry you” and picks up Frodo and makes a run for he mountain. What an incredible moment that is! I just feel that this film really has everything, the adventure, the action, the romance and plenty of friendship. I think that’s a reason why you cannot help but be taken in by it all. You care about all of the characters and want them to be safe, to be able to have a good life after the great battle. The issue I had with the battle was the way in which the army of the dead kinda wiped everyone out, after what had been brilliant battle and fight scenes. Just made it look a little bit easy. I know one of the biggest criticism of this film is the ending or should that be endings? That doesn’t really bother me too much but I think some of it could have been done slightly differently just to avoid it going on and on and on. Maybe the fact that the screen actually goes black a few times doesn’t help. Because let’s face it that is usually the end of a film when it goes black. This therefore leads the audience to believe that the film is finished when in reality it still had plenty of time left to go! Emotions really do run high watching this film, the small moments all put together with the realisation that there is no more after this film really does hit home. I still get sad watching it now as it really is the end of it all. I still feel like that watching now after all the hours I spent watching the special features on all the DVDs and really felt like I knew all the cast and that we got to see how much fun they all had making these wonderful films. This was probably the first film that I actually saw twice at the cinema (what a film to see twice on the big screen) and I enjoyed every second of it, still even have the cinema ticket from one of the trips! Even kept the popcorn box with Aragon on it for years, think it’s possibly gone now. It’s actually quite scary that it was 9 years ago when it all ended! 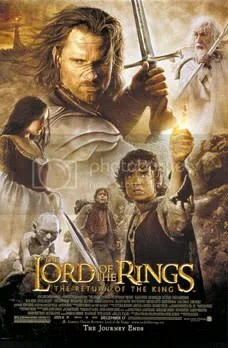 Is Return of the King your favorite? It really is, but the question now is will The Hobbit be better? I still can’t decide which one of the three is my fave, but leaning towards Two Towers. But hey, I think the entire trilogy is superb IMO. Yeah it’s such a hard choice, as they all have fantastic moments. Fellowship I have probably seen the most but it’s just getting to going, so tough to choose! Just as Peter Jackson felt that LOTR had to be made as one large, three-part, cinematic piece, I decided to write my IMDb review of all three movies as a single, multi-part essay. Click on my screen-name and hit “Chronological” to view my reviews of the Fellowship and Two Towers. I make no guarantees about the quality and consistence of my review, but I do guarantee that these three films offer very high and very consistent quality from beginning to end. The acting, cinematography, art, and direction simply can not be beat. Which of the three movies is my favorite varies with my mood – and the same holds true for Tolkien’s books. When I am immersed in the story, ROTK is my favorite. When I simply want to have fun with the whole experience, I love Fellowship. And when I want something intense, evocative and thoughtful, I go for the Two Towers. Frodo, Sam and Golem are on their way to Mount Doom and their bodies, nerves, and relationships have borne the greatest burden on middle earth. The rest of the fellowship is rallying to the defense of Minas Tirith, and preparing for even more deadly battles to come. The heroism and romance are incredibly moving – when was the last time you saw an entire audience leaving a theater after a fantasy movie rubbing their eyes? The sets are breathtaking – even moreso than in the previous two films. The casting and acting are superb. The film delivers at every level and is the jewel in the trilogy’s well-earned crown. Return of the King offers a resolution of all of the major story arcs in LOTR. As with the classic Tolkien trilogy, however, you may be able to predict some of what will occur, but never all of it and you’ll never guess how you will get there. The same fatalistic and paradoxically unpredictable feeling of Tolkien’s grand plots is present throughout ROTK especially. The major theme in ROTK, however, is the varied ways and means of heroism – both intentional and unintended, and Tolkien’s examination of sacrifice and heroism is as inspiring as it is subtle. Amazingly, it all comes through in the films. Even more than the previous two films, Jackson and his writers took liberties with the story-line. Like the others, however, this serves the film better than simple adaptation from one medium to another. By reordering some of the chronology and adding scenes and plot devices which are consistent with Tolkien’s world and characterizations, the film-makers actually do a better job of preserving the concepts and themes of the story than they could have with a pure adaptation. The lengthy epilogue in Tolkien’s book is greatly reduced, reordered, and somewhat changed in order to work in the film. Some parts actually appear very early in ROTK. And some aspects of Tolkien’s epilogue are disclosed in the Two Towers, though not directly depicted. But all of the really important components of the epilogue are, at least strongly implied if not well illustrated in ROTK. I felt so many emotions watching this wonderful movie, it moved me so much. So many more amazing scenes! I’m always emotional when Arwen sees the vision of her son and it moves her to tears and she decides to renounce her immortality. That’s so cool. I love the way that Arwen doesn’t need to speak a word for us to know what she is feeling, everything is projected from her face as we witness the love and the power that comes with it.